Many people believe that August signals an annual decline in the housing activity, with the idea that school starts in September and everyone has made their move. Keep in mind not all buyers and sellers have children. Historically as as temps decline so does the real estate market. This year with incredibly low inventory the competition for the few homes that come on the market is expected to continue to lead to multiple offer scenarios for the available listings. Smart sellers know that their houses can be sold at any time. Buyers are learning that they have to be ready to pounce whenever a property of interest hits the market. The market could stay active right through the holidays because of the disequilibrium between pent up demand from buyers and lack of inventory. The good news...Prices continue to rise and the Median Sales Price increased 2.8 percent to $205,000, highest it's been since 2008. Days on Market was down 33.9 percent to 37 days. Not a record but very close. Sellers should be encouraged the Months Supply of Inventory is down 44.8% from last August with a 3.2 month supply of homes available. 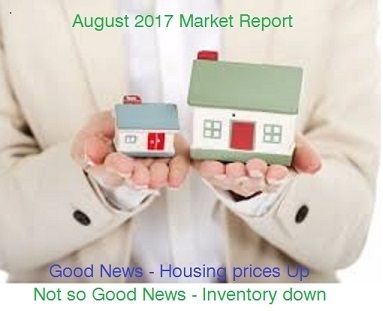 The not so good news... New Listings were down by 8.2 % to 954 at the same time that Pending Sales were up 6.6 percent to 792. There have been no major changes in the economy that affect housing. Factors that normally move the housing market such as wage growth, unemployment and mortgage rates have been stable through the summer.